Pretentions notwithstanding, it appears that the stage is being set up for a Noynoy Supreme Court (SC), using as smokescreen the many names and characters that are being nominated to the post of chief justice left open after the removal of Renato Corona. This would be the first time that the Judicial and Bar Council (JBC) to be submitted to Noynoy from which he will pick the successor of Corona, will be packed with so many names, many of which are nuisance candidates, if equated with the presidential elections. Based on the pronouncements and acts of Noynoy, the next head of the SC chief justice would likely be somebody who would carry out his whims and caprices and one who will fulfill the retaking of the high court. The law no longer matters and can be dispensed with by the Aquino court, on the issue of the Smartmatic precinct count optical scan (PCOS) machines. The Supreme Court (SC) ruled that the P1.8-billion purchase contract between Smartmatic and the Commission on Elections (Comelec) was valid, as it cited the deadline facing the poll body to ensure credible automated elections next year emphasizing too, that no alternative has been offered by critics which have pointed out the technical defects in the machines as well as the government’s procurement rules that stated the invalidity of the contract. Former POEA chief axed because of politics? “When he assumed office, he immediately conducted consultations with us to learn about our needs and demands. He was clearly still new to the job but we appreciated his sincerity and good intentions for OFWs,” said Garry Martinez, Migrante International chairman. However ,last January 2, Cao was replaced by former Labor undersecretary Hans Cacdac. News reports said Cao did not receive any official word from the Office of the President, which appointed him to the post, that he would be removed or would be replaced. It was the higher-ups from the Department of Labor and Employment (Dole) who informed him. He said he has no idea about the reasons behind his ouster. “I don’t know why they removed me from my post. There has been no issue of corruption, no scandal. In my personal view, I was able to manage the process flaws in the agency. 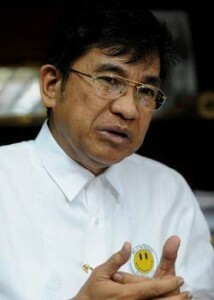 I can’t understand why I was replaced,” Cao said in a forum held last June 11 conducted by Migrante International. Cao was invited as a reactor in the “Summing-up of the State of Migrants Under Aquino” held at the University of the Philippines. According to Cao, he was the first administrator from the private sector to serve in the POEA. He was chosen by Aquino from a list submitted by the search committee. “I don’t know the president personally, not even Dole Sec. (Rosalinda) Baldoz.” Cao worked as chief legal counsel and head of the Human Resources Department of Mitsubishi Motors Philippines Corporation for 19 years and is now serving as Senior Vice President and Special Assistant to the Chairman of the State Group of Companies. “I have a special burden for OFWs for the longest time. I have neighbors who are working abroad, two of my siblings are also OFWs and my brother-in-law is also a seafarer. So maybe God agreed to put me in POEA,” Cao said in the forum. China has launched its first manned space docking mission, including the country’s first ever woman astronaut. China moves one step closer to becoming the second nation in the world performing regular space flights. ­The Shenzhou 9 spacecraft was successfully launched at 10:37 GMT from the Jiuquan launch center in China's north-west Gansu province boosting the country’s hopes of realizing its space ambitions. There are no less than some 32 different forms of illegal gambling in the Philippines — from “Alpor” to “Video Karera.” Furthermore, there are also more than 17 modalities of the called legal gambling in the country — from bacarat to slot machines. Is it the chilling effect or still corruption within? A texter of my daily radio program has pinpointed that the recent ruling of the Supreme Court (SC) upholding the validity of the Comelec’s purchase of Smartmatic Pcos machines was a product of the impeachment of Chief Justice (CJ) Renato Corona. Before his conviction, the former CJ warned that his impeachment and conviction will have a chilling effect on the members of the highest bench. This was reiterated by former CJ Reynato Puno in a speech delivered by him where he admitted that the Corona’s impeachment had indeed cause a chilling effect on the SC. A major item in the proposed P2-trillion budget for 2013, when the mid-term national elections will be held, is the P45-billion budget for the conditional cash transfer program (CCT) representing a P6 billion increase from this year and which a militant solon associated with the expected massive campaign spending prior to next year’s polls. President Aquino has ordered all Philippine vessels engaged in a maritime standoff with China to pull out from the disputed Scarborough (Panatag) Shoal, citing bad weather, a Foreign Affairs official said. Aquino ordered a Coast Guard patrol vessel and a fisheries bureau survey ship out of Scarborough Shoal in the South China Sea on Friday night, Foreign Secretary Albert del Rosario yesterday said. “Last night, President Aquino ordered both of our ships to return to port due to increasing bad weather,” he said in a statement. A crisis management was formed by the local municipality of Patikul in Sulu province in a bid to recover the missing Jordanian journalist and his two Filipino companions, according to the Philippine National Police (PNP). The PNP said the three are still considered missing because there is no confirmation yet that they were indeed abducted. Earlier reports had said the group was abducted by men believed to be members of a kidnap for ransom (KFR) group. The teacher shortage in Region XII or the Soccsksargen Region’s 396 public secondary or high schools has increased to 2,657 as the total enrollment in the area was seen to hit nearly 240,000 by the end of the month. Herlita Caraan, National Statistical Coordination Board (NSCB) Region XII chief, said data released by the Department of Education (DepEd) Region XII show that the area’s high school population for school year 2012-2013 was projected to grow by two percent and reach a total of 239,058 students. The Philippine Deposit Insurance Corp. (PDIC) announced that it will start paying valid deposit insurance claims of depositors of the closed Export and Industry Bank (EIB) on June 19 in three batches. Starting on that date, the first batch of the claims settlement operations (CSO) will be conducted at the Head Office and 12 other branches, namely: Bel-Air, Pasay Road, Rufino, Acropolis, Cubao-P. Tuazon, Bian-Carmona, Calamba, Angeles, Baguio City, Dagupan, Cabanatuan and Mabalacat. The Alliance of Health Workers (AHW) has called on the Department of Budget and Management (DBM) to stop making “palusot” (excuses) and instead approve the release of savings for Magna Carta benefits. This is in reply to the DBM press release on June 11 after health workers stormed DBM office in Manila armed with empty pots and pans to demand the release of their benefits. The House of Representatives has approved on second reading a measure encouraging witnesses to enter the government’s witness protection program by providing better protection and benefits to them to ensure the speedy and fair disposition of justice.